While 82% of employees want to discuss their career prospects with their managers at least 1-4 time per year, a shocking 40% never do. A recent study from Robert Half revealed a disconnect between managers and their employees on one of the most wanted aspects of any job. So important, in fact, that 32% of more than 11,000 employees surveyed by LinkedIn cited ‘Strong career path’ as the number one thing they look for. For managers, it makes even more business sense. If progression is so important, and most employees want to regularly discuss it, why don’t they? For employees not entirely comfortable being straight with their superiors, asking a direct question about their future in the company can be daunting. Fear of rejection is a common aspect of human nature wherever you look, and employees could even think it might harm their chances in the future if they seem too eager or too focused on their own career over the good of the company. Employees might think they are already being overpaid in their manager’s eyes, and not want to push it. Even if the employee thinks they deserve a promotion or a pay raise, they know it’s not their call and ultimately up to how much their manager recognizes their value as an employee. Employees with poor self-image likely make up the bulk of the 40% who never discuss careers with their manager; they’re happy plodding on with the same position they’ve held for years, believing that they aren’t cut out for more responsibility. Employees might be worried about being told the truth — that their career is not looking like it will progress any time soon. Situations like this trigger a fight or flight response; the employee must decide whether to stay in the job and fight for a promotion or to look for a better option elsewhere. This isn’t a position any employee wants to find themselves in. When it comes to knowing who is next in line for promotion, some would rather blissful ignorance over the hard facts. Employees who won’t be getting their target promotion are better off knowing so they can look for a job where it will be possible. When there are limited opportunities for career progression in a department, if managers speak with every employee about their career prospects and find each one of them wants the promotion, the manager is at risk of making one employee happy at the expense of disheartening the rest. No manager wants the difficult “we’re actually not promoting you and nope — no raise either” conversation, so the tendency to avoid disappointing people is only human. No matter how badly an employee wants a raise or a promotion, it could just be a simple fact of no open positions or not enough money to afford it. Which manager would want to admit the department can’t afford to pay its employees a higher salary? That’s the sort of thing which would induce panic in the office and create a feeling of hopelessness in every employee. 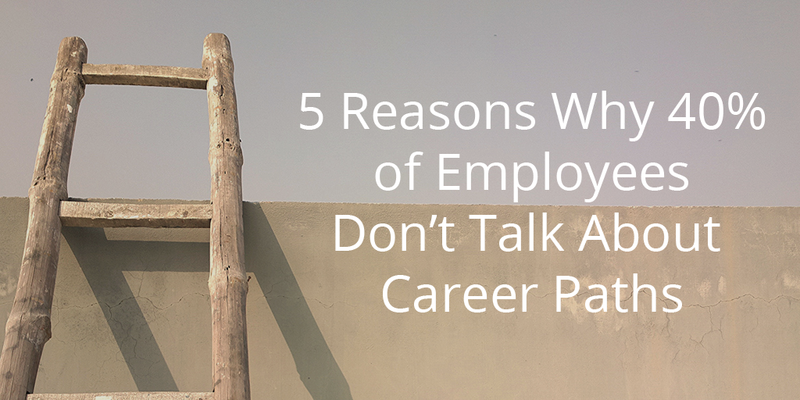 If there’s no opportunity for employees to have a real discussion about their career prospects it could be because there’s no room for advancement right now. From this perspective, which is more tailored towards startups than enterprises, career communication is worth a lot less. In reality, conversations about career paths don’t just mean asking for a promotion or a raise: they are valuable times to focus on something other than deadlines and projects for an hour in the year. They are a time where employees can feel happy about how their manager views their performance and know what they need to be working towards to start moving up. In short, managers and employees should take this relatively small time out of their loaded calendars to discuss something they feel extremely important… but they don’t, because they’re scared of what might happen if they did.